Yes, you can be over 40 or 50 and still find a good job. This is a guest post by Leslie Williams. If you’d also like to guest post here on JobMob, follow these guest post guidelines. Switching jobs can be a great experience. It can allow you to move up, take on more responsibility, make more money, and expand your skill set. In some cases, it can be a reason to move to a new city, adding a whole other level of excitement to the new job. But even if you switch jobs voluntarily, it's still one of life's most stressful events. 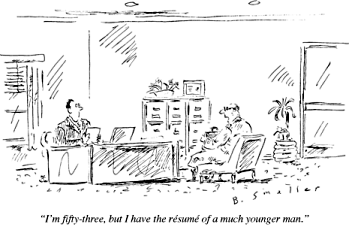 And let's face it—once you hit a certain age, it becomes a little trickier, especially if you're not going directly from one job to another, but find yourself unemployed for whatever reason, needing a new job, and possibly competing with younger candidates fresh out of college. Don't despair. While you may need to make some adjustments to how you perform in job interviews, and how you negotiate accepting a job that's offered to you, finding a job when you're 40 or older isn't impossible. In fact, your age can even work to your advantage. It's unfortunate, but age discrimination does exist, and still occurs in some workplaces, especially in this age of technology and the Internet. People of older generations may be perceived as not as knowledgeable about, or as willing to adapt to the faster-paced, electronically supported workplace. There are many other misconceptions about older workers as well. This is where you get a chance to really shine. If you find yourself having to look for a job at an age that might be considered out of touch by some employers, use the time between jobs to take a class. Of course, you may already be very well versed in new technologies, but an actual certificate from an accredited institution will make a good companion to your resume, and put any potential managers' concerns about your abilities to rest. Read trade magazines, Web sites, and blogs to find out what's going on in the industry. Also, brush up on the vocabulary related to the career field you're targeting. Don't let any unfamiliar terms or acronyms trip you up in the interview. After being part of the workforce for 20 or more years, you most likely built yourself up to a point where you were making a comfortable salary. If you're looking for a job now, you're competing with younger people who don't have as much experience, and therefore don't warrant the salary you may be used to. A company can sometimes save money by hiring them, even if they need more training than you do. Be flexible when discussing salary and benefits. Realize that you may need to accept less than what you were making before, but keep a couple of things in mind. First, consider everything you're offered as part of your compensation. If the salary is lower, but you get great healthcare benefits, things may balance out a bit more. In addition, discuss whether there will be opportunity for advancement. Your skills and experience may allow you to move up more quickly, and work your way back up to where you were before in a shorter amount of time than it would take a younger hire starting from scratch. By the same token, don't just jump at the first offer because you're afraid of the job offer being revoked. Talk to the potential employer to see if there's any room for negotiation. Okay, so you're a little older than most of the other applicants. Accept it, and realize it can be a benefit. For one thing, if you're not just switching jobs to try something new, but are seeking a job in the same industry you've always worked in, you're bringing a heck of a lot of experience and knowledge with you. Your competitor job applicants may have youth on their side, but you won't need as much training to get up to speed and start producing. Make sure you play up your experience in your resume writing, and in job interviews. That, coupled with flexibility about salary, can give you an advantage. In addition, you're bringing maturity, and no, that's not an age joke. Younger people just out of college can sometimes be brash and make snap decisions led by their emotions. This isn't true for all people of that age, but for some. You've already outgrown that, and by now, should have the ability to put your emotions aside and make decisions based on facts, your experience, and what's good for the company. You bring wisdom that will allow you to better handle crises, and to offer support to your coworkers when they need it. A good manager should recognize the benefit your maturity brings, but there's nothing wrong with mentioning this in a polite, non-challenging way so as not to ruffle the feathers of a manager who may be younger than you are. Looking for a new job when you're 40 or over can be scary. Just remember what you're bringing to the table, and realize that if a company or manager doesn't recognize your experience and maturity, you may be better off working in a place where those things are welcomed and appreciated. Leslie Williams is a writer for Jobfox Resumes, the largest resume writing service online. She enjoys helping people of all ages find the right career. If you found this article useful, I highly recommend you continue with my 40 Tips for Job Seekers Over 40. Subscribe to JobMob via RSS or email and follow me on Twitter for the best job search ideas for older job seekers. When you’re over 40, really interesting events in life and in your career just start happening. Previous PostProfessional Recruiters: Job Seeker Friend or Foe?